Dexter Daily: Michael C. Hall On Directing a Dexter Episode: "It Was More Enjoyable Than I'd Imagined"
Michael C. Hall On Directing a Dexter Episode: "It Was More Enjoyable Than I'd Imagined"
Hall has experienced numerous lasts in making the concluding season of Dexter, but there's also a first for him: directing. "I went in hoping it wouldn't be as stressful as I feared it would be, and it actually was more enjoyable than I'd imagined," Hall tells Zap2it. "I'd never directed before, but if I was going to take that step, certainly doing an episode of this show made sense. I know the crew very well, and I was able to prepare before we started shooting the season. "Dexter is a very subjectively told show," Hall notes of his voiceover narration that runs through each episode, "so for the actor who's playing Dexter to also direct, it's not that much of a stretch." Read the rest after the jump. Nevertheless, Hall went in knowing he'd still be spending a lot of time in front of the camera as well as behind it. "If Dexter were to go into a coma, I don't think I'd want to direct that episode anyway," he muses. "Part of the deal was that I had to relinquish some of the control over the shots I was in, but it was actually nice to spend time on the set with an more open and available energy." Jennifer Carpenter, Hall's principal Dexter co-star (and his former wife), says it was "ideal" having him guide her through her paces as Dexter's half-sister Debra -- especially since she's at a watershed point with her character, who's grappling with having killed to protect Dexter's lethal secret life. "He knows the show like no one else," Carpenter maintains. "I can ask him. 'Do you remember when ... ?' And he'll give you the season, the episode number and the section of the episode it came in. I'm not sure how he's been able to retain it all. I sort of shoot it and shred it, just to survive." Though Hall gets the credit for steering the next Dexter episode, Carpenter is confident he'd agree it was "a team effort. He knows how to speak to actors, and he has the trust of everyone in the cast and crew. And the episode is fantastic. There's a scene between Debra and Dexter in a corridor, and it's shot so beautifully, you'd still 'hear' it even if you turned the sound down. "I would do anything he directed," adds Carpenter. "He really has a talent for it." 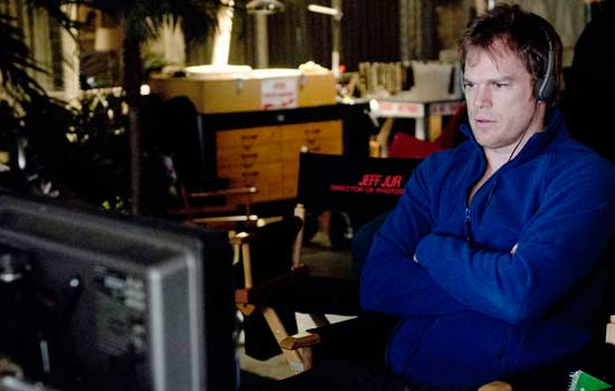 Hall believes his opportunity to direct came at the perfect time in "Dexter's" soon-to-end history. "It was nice to feel connected to the crew in a new way," he reflects. "These are people I've spent a lot of time with, so to be in a position where you're required to be decisive so that other people can do their jobs was something I enjoyed."